Chicago native Aja Evans, a two-time Olympian as a bobsled push athlete, loves pizza, declares her love of hot dogs, and swears by her hometown’s sushi scene. It is just two words, but it will probably generate quite an animated response. “Cheat meals? I love cheat meals,” Hilary Knight says. “Oh my gosh, cheat meals, I could go on and on about,” Elana Meyers Taylor says. “A cheat meal for me is . . . uh, where do I start?” Aja Evans says. The concept of a cheat meal is simple: It acts as a pressure relief valve for someone sticking to a strict nutrition regimen. It is a semi-regular chance to consume those fried, cheesy, buttery, or sugary treats in lieu of the protein shakes, leafy greens, lean meats, portions of fish, or slices of fruit. For Olympic athletes, nutrition is vital for performance. For bobsledders, whose sport has a limit for the total weight of the sled plus the crew, nutrition is key so athletes can meet their targeted weight. 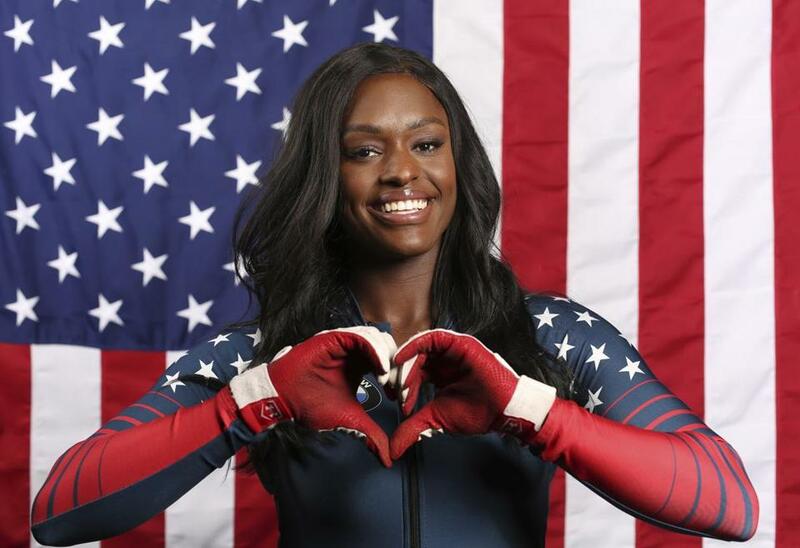 Evans, a two-time Olympian as a bobsled push athlete, has been working with a nutritionist for the past year to remain under her targeted weight and avoid disqualification. Evans must keep a close eye on her weight throughout the season, and her nutritionist has helped keep her focused. But that does not stop the occasional departure from a “pretty clean” nutrition plan. The Chicago native loves pizza, declares her love of hot dogs with a big laugh, and swears by her hometown’s sushi scene. She loves her mother’s Thanksgiving spread, and has a postrace ritual that includes her favorite sweets. “I have these two things: I always have this chocolate bar that I completely love over in Europe, and these sour apple rings. Those two things are always in my bag after my race because it’s like my little celebration meal,” she says with a big smile. Knight, a three-time Olympian and two-time silver medalist as a forward for the US women’s hockey team, does not much like the leafy greens, preferring to use smoothies as the vehicle for those nutrients. But a smile comes across her face as she enthusiastically lists her favorite culinary indulgences. Before Brianna Decker, Knight’s teammate who is a two-time Olympian, has a chance to detail her nutrition regimen, Knight leans back and hands Decker a mini chocolate bar. The two giggle. Decker goes on to outline her usual diet: fruits, vegetables, chicken, steak, fish. But she has a sweet tooth for ice cream and has since she was a kid. It is usually of the chocolate chip cookie dough or coffee variety. Gus Kenworthy, a two-time Olympian in slopestyle skiing, shares that particular love of ice cream. Although the 2014 silver medalist tries to minimize dairy intake and avoid refined and processed carbohydrates, relying mostly on protein and vegetables as his main sources of fuel, he succumbs to that sweet tooth. “And I have very little willpower to stop,” Kenworthy says. But when he does satisfy that craving, he uses it as motivation the next day in the gym, rather than chastising himself. For six or seven years, Liz Stephen has been gluten-free. After determining that gluten was affecting her in a negative way, Stephen cut it out. That has posed a particular challenge for an Olympic Nordic skier who travels for competition in Europe four months per season, leaving her with little control over food options. “Being elite athletes, we’re trying to get these tiny percents better, and I think living on the road and just being at the mercy of hotels and whatever food they put out is maybe the biggest percentage of where we’re missing,” she says. Still, Stephen, who prefers foods that make her feel good, acknowledges, “My heart still hurts a little bit when somebody bakes like a fresh loaf of bread.” And she loves cake and is a big-time gummy bear fan. “Carrot cake that’s supposed to be really dense, it transfers pretty well to gluten free, so whenever those are options, I really love good carrot cake,” she says. Cake is the sweet spot, too, for Meyers Taylor, a bobsled pilot going for her third Olympic medal. Specifically, red velvet cake. Her nutrition regimen calls for her to consume 1,700 calories per day in her quest to maintain her targeted weight, usually through lean proteins and vegetables. But that red velvet cake — it was the only demand she had in the planning of her wedding. Jamie Greubel Poser, a bobsled pilot competing in her second Olympics, often has similar struggles finding the more healthy options while traveling so often. When she joined the national team, she needed to add 20 pounds and is therefore on the “gain-and-maintain” plan, trying to eat more calories than she burns. And she acknowledges that can get a bit tricky on the road. But she still has her favorite cheat meal items: Key lime pie and creme brulee. After a long stint on the road, the 2014 bronze medalist will hunt down an American favorite: chicken wings. Although she has found wings in Europe that can kind of satisfy that specific craving, it simply lacks the same zip — no ranch dressing, no Buffalo sauce. “So as soon as I get home, a lot of times that’s the first thing that I’ll get is those flavors that are American and we’re really used to,” she says. For Nordic skier Sadie Bjornsen, a two-time Olympian, the cheat meal that beats all other cheat meals is nachos. The tortilla chips, in particular, are a favorite. Although Bjornsen has worked with a nutritionist the last two years to zero in on how to tailor her day-to-day intake based on her training loads — “every calorie really matters and the quality of the calorie matters,” she says — there is still room for the occasional snack bounty. Although these Olympic athletes are frequently disciplined about their food intake, there has to be a balance with satiating the cravings for comfort in whatever form that may take, Knight says.